The 3M Scott Safety FlameVision FV300 Flame Detector uses Infra-Red Array based sensing technology to provide the ultimate programmable flame detector. 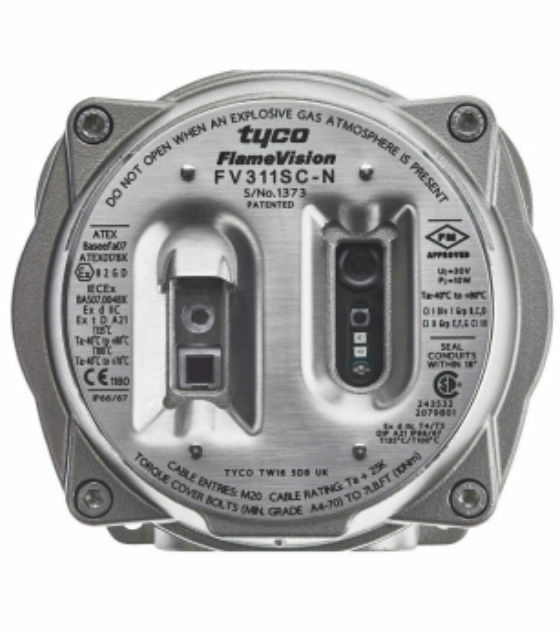 FLAMEVision FV300 uses Infra-Red Array based sensing technology to provide the ultimate programmable flame detector. An array of 256 infrared sensors plus two optical channels view the protected area. Powerful algorithms running on a Digital Signal Processor (DSP) are tuned to the characteristics of a fire and accurately the signals from these channels quickly and reliably identify fires. A key advantage of using an array is that the detector can accurately identify the location of the flame within the field of view. The location information is used to overlay a marker on the live video output to highlight the fire location. The user can quickly see the location of fires, and decide on the appropriate action. The location information is also available on the field network interface. User defined areas within the field of view can be masked and un-masked dynamically to improve reliability and maintain maximum coverage at all tImes. The detector can be supplied with an optional integrated color video camera to display a live image of the field of view. This is in addition to the alarm location and status information, which is available as standard on the video output.